Have you ever noticed how green your lawn may look in some areas and a little less lush in others? Or, maybe you’ve noticed some funky odors or damp spots around your water tank or pipelines. Typically, these are signs of a broken sewer line which, if left unnoticed or unfixed, can be costly and waste your resources. In order to avoid the repercussions and resource waste of a broken sewer line, you should be aware of the various symptoms of one. So, the following are 7 symptoms that a broken sewer line may exhibit. If your water bill is 10 dollars off this month, there probably isn’t any need for concern; however, if there is a 100 dollars plus increase in your water bill, then an alarm should go off that something is wrong. Your first step would be to contact your water company to find out whether it was a billing error or if there is something larger at play. People often associate a clogged pipe with sediment buildup in the pipe; however, that isn’t always the case. Pipes that are frequently getting clogged is also a symptom of a broken sewer line and will likely need a video inspection and the assistance of a professional plumber. Having low water pressure is a simple indicator of a broken sewer line with possible larger implications, such as flooding in other areas and wasted resources. Musty odors are big indicators of mold and mildew both of which are fungi that form in moist surroundings. So, if you smell something that seems off, it may be a result of a broken sewer line. If you notice damp spots on the walls, floor or ceiling, it can be resulting from a broken sewer line. Having a lawn that has patches of extremely lush and green grass can indicate that an uneven portion of your lawn is being well hydrated while other parts aren’t. This can happen is there is a break in your sewer line and water is permeating a concentrated area of your lawn. Again, mold and mildew grow in moist areas. Therefore, if you have a broken sewer line, the water may be leaking and soaking into the walls, floors and ceilings of your dwelling—a perfect habitat for mold and mildew to grow. 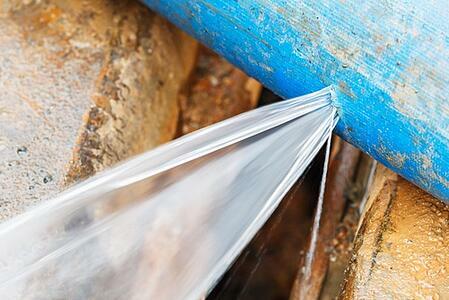 Have a Symptom of a Broken Sewer Line? If your residence is experiencing one or multiple symptoms of a broken sewer line listed, then you may want to investigate. It may be nothing, or it could be something that is financially straining and resourcefully wasteful. Contact a professional plumber if you need help determining what is causing the symptom(s) and can help remedy your sewer line.